This post is part of a piece to be published under a pseudonym. But, back to England and my mother. She had a phrase – used tiresomely often – from which the title of this little offering is taken. She used to say… “Funny! Ha, ha!”. This was as close as she ever got to a breath of sarcasm, to which my father, a self-made man who worshipped his creator and, well-trained Pavlovian that he was, would rumble “No. Funny peculiar” from behind his newspaper, to gales of merriment underlain by the grinding of my pre-adolescent teeth. Which probably accounts for the horrendously awkward overbite which I now have the misfortune to suffer from. Never let it be whispered that old Perry has a political bone in his body. I haven’t, and the thought of tramping about waving some species of placard bearing some outrageously simplistic meme does turn the old stomach a bit. Especially when accompanied by large women wearing glasses with a revolutionary gleam in their eyes and a hedonistic desire to be hauled off to the calaboose by the local constabulary. Nevertheless, in common with what appeared to be half the population of the republican Shangri-La where I now make my home, in response to the well-documented incidents in Paris, where people were actually killed because of a cartoon, I turned up the other week, and milled about anonymously for a bit, more out of idle curiosity than anything else to see what all the fuss was about. Now, I want you to hear me clearly. In the soul of every Frenchman is the instinct to do two things. First, to pee wherever he pleases, whether in a public place or not and second, to think, say and even draw whatever he likes. 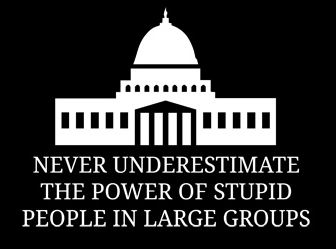 It’s generally believed that this is called Free Speech. 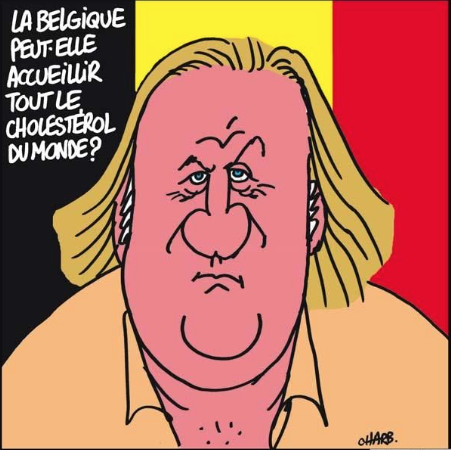 You may not agree that this image of the grossly overweight French actor Gérard Dépardieu with the caption “ can Belgium welcome all the cholesterol in the world?” – he left France to live in Belgium in order to reduce his tax bill – is remotely amusing, but some people think that the right to say it is the important thing. It pokes fun at Mr Dépardieu’s excess poundage and it ridicules his decision to leave for a cosier fiscal climate. The joke is supposedly satirical. The Purists among us refer –rather grandly – to Satire as a ‘genre’ of literature or art, in which all manner of vices, follies, abuses, and shortcomings are held up to ridicule, ideally with the intent of shaming individuals, corporations, government or society itself, into improvement. Although satire is usually meant to be funny, its greater purpose is often constructive social criticism using wit as a weapon and as a tool to draw attention to wider issues in society. On the other hand, so my mother told me, satire is when people poke fun at their elders and betters to make a point and is a nasty, low form of gutter entertainment much like watching people being torn limb from limb in the Roman amphitheatres. She once referred me to this, without a flicker of expression. We do live in an age of the quick-fire riposte, the headline tweet, the unforgettable meme. It’s never been easier to show off our satirical skills on social media and magazines. No, I’m not going to draw a cartoon, although we might notice that just about every newspaper known to mankind has a resident cartoonist. Perhaps a statistician might disagree, to which my response would be in the words of the anthropologist and literary critic Andrew Lang: “He uses statistics as a drunken man uses lamp-posts – for support rather than illumination.”For myself, I’ve always rather admired those who use the written word, irony and sarcasm with the skill of a master fencer but whatever happened to the art of the glorious, perfectly timed, off-the-cuff insult? Returning momentarily to Oscar Wilde: “Some cause happiness wherever they go; others, whenever they go.” So, this might be a good time for me to go, too. If I have upset anybody, by word or implication, I am sorry, perhaps I have Van Gogh’s ear for music. If I have, in the words of Mark Twain, “why do you sit there looking like an envelope without any address on it?” Say something!